Following in the footsteps of CAO’s world-renowned Brazilia cigar—which is often credited as normalizing the usage of Brazlian tobaccos in premium cigars—the brand sought to introduce even wilder and untamed tobaccos with a limited edition cigar called Amazon Basin. Using indigenous tobacco known as Bragança, CAO blended a truly unique smoking experience that became something of a cult hit when released in 2014. After returning to the Amazon rainforests of Brazil—this time to a region known as Alagoas—CAO encountered the natives fermenting tobaccos in unusual, snake-like ropes that they call Fuma Em Corda. The tobacco is a common Brazilian Arapiraca varietal, but the ancestral process of fermenting the leaves in tightly bound coils (rather than the usual pilones method) produced a rich and heavy flavor like nothing else! CAO loved the tobacco so much, they bought the entire year’s harvest. The Fuma Em Corda tobacco was then shipped to Honduras to allow the CAO blending team to take over. Like the original Amazon Basin, Bragança tobaccos were used, this time in conjunction with the new Fuma Em Corda leaves, as well as Nicaraguan and Honduran tobaccos in the filler. Keeping with an exotic theme, African Cameroon was selected for the cigar’s binder, and a reddish-hued Honduran Colorado Oscuro leaf was chosen as the cigar’s finishing touch (wrapper). Keeping with the Amazon Basin style, tobacco leaves are then twisted and bound around the cigar’s midsection, acting as a smokable band—which is highly recommended! 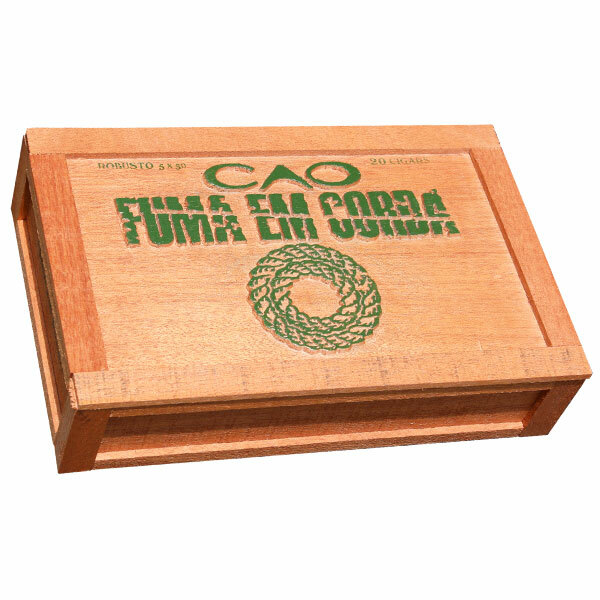 Due to the unique tobaccos used, CAO Fuma Em Corda is very limited and has been known to sell out fast! Secure your order to experience a medium-plus body and savory notes of black pepper, dark espresso, leather, and chili pepper chocolate candy.